RAISING FUNDS FOR DESMARE PLAYGROUND! In Faubourg St. John we are always thinking of our neighborhood’s open spaces. From Bayou St. John, to our bridges to the beautiful small parks that connect us, we proudly take a pro-active response to ownership and maintenance of these spaces. 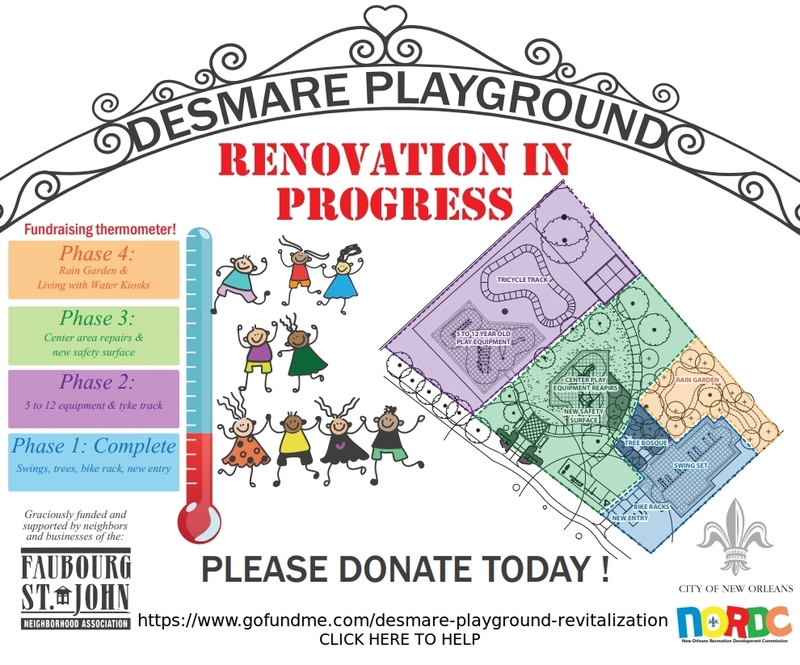 We again want to move forward and be responsive to the needs of our neighborhood and our growing population of young families; we have Desmare Playground at the 3400 block of Esplanade in our sights and we need your support! Phase One was completed in May of 2018, now on to the next! 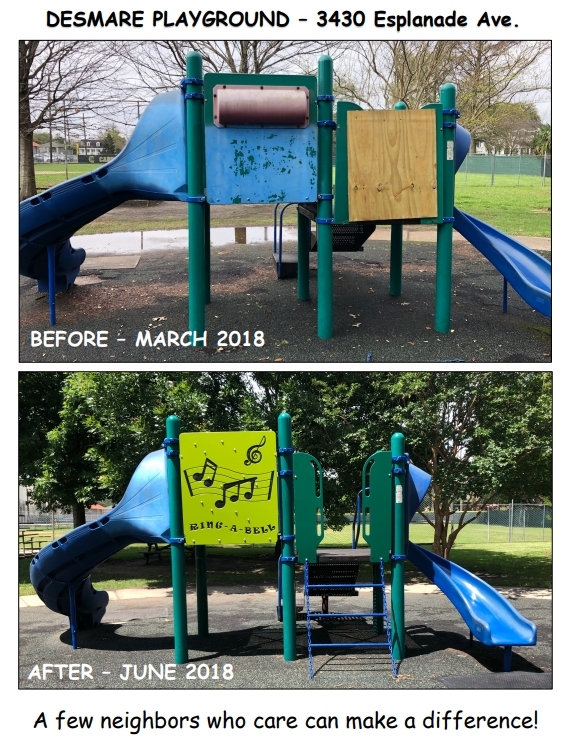 The goal of the Faubourg St. John Neighborhood Association (FSJNA) is to revamp the currently worn-down playground and make it a more welcoming place for children and neighbors. With the newly complete phase one additions of: a beautiful swing-set, repair of the existing playground equipment and planting of 11 native trees we are ready to move to the next phase: refocusing the basketball court to be “little kid” friendly and re-purposing space outside of the play equipment and ball field for family wellness as well as “kid-centric” neighborhood events, adding a play area and equipment for ages 5- 12 and installing an educational Rain Garden to show how New Orleans can better “Live with Water”. Bottom line, we want this playground to be a special place for all. 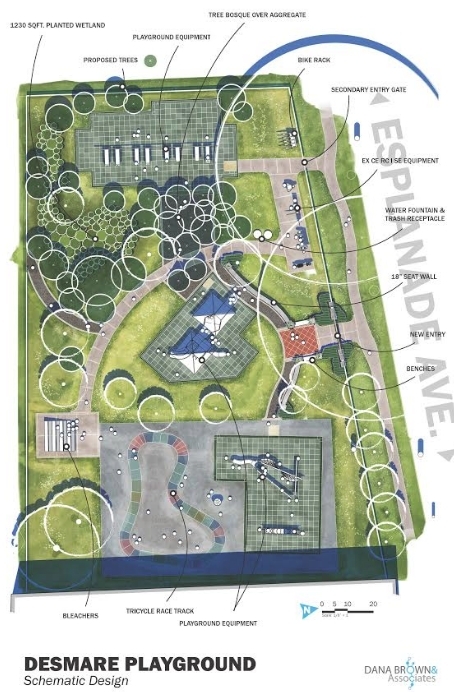 Working with Landscape Architect Dana Brown & Associates (DBA) on the master plan, FSJNA involved the community in the playground planning process. On January 26, 2013, Desmare Playground held a kid’s charrette where neighborhood residents were invited out, with their children, to have a chance to draw and express what they would like to see in the new playground redesign. The event was a success with a number of families showing up and showcasing their creativity. With white boxes and sidewalk chalk the kids drew their playground ideas. These ideas ranged from swing sets to duck ponds. The new master plan was developed from the charrette input and keeps it simple providing a maximum play experience for the kids but with an eye towards easy maintenance, sustainability in design, and solves the storm water management issues with a rain garden. The new features are extraordinary: Swings, new play structures for different age groups, a new exercise station for adults, more integrated circulation, overhead canopy, a tricycle track for younger kids to cycle around, waste receptacles, bike racks. All new design features in the park are ADA accessible, including the aggregate paths. 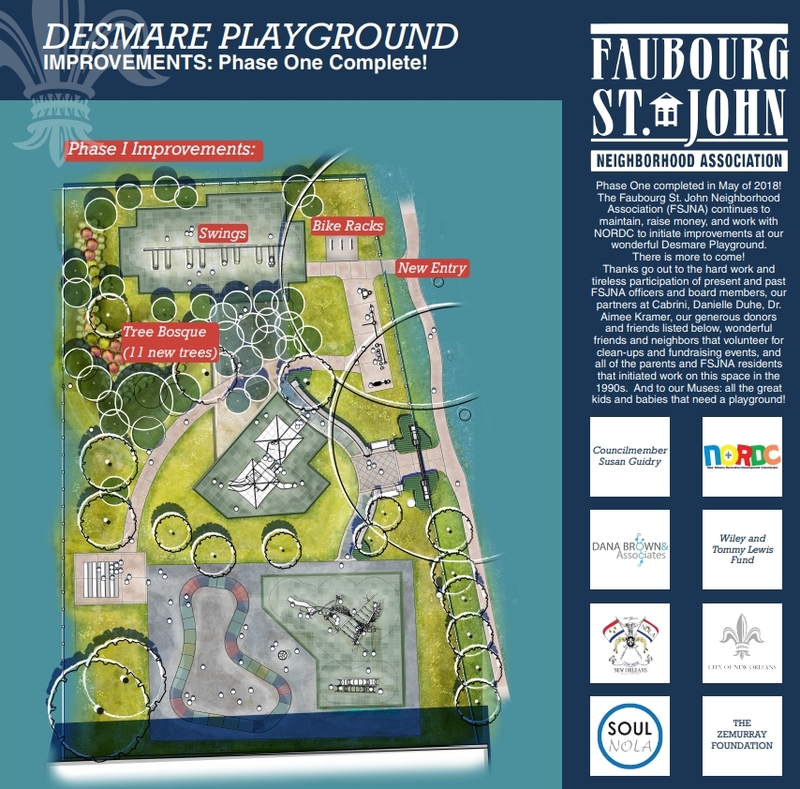 Phasing for the new Desmare Playground is designed to be implemented as the Faubourg St. John Neighborhood Association raises funds. Each phasing section can be constructed in pieces or as a whole. Fund raising is the hard part; we have raised funds and paid for the design work. Our plans are approved by the City of New Orleans. Phase One took 5 years of fundraising and is now complete. With your help, we hope to raise the monies needed for Phase Two in half that time or less!